What is GHI Raspberry Ketone Pure? 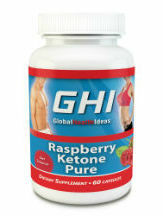 Here is a review of GHI’s product, Raspberry Ketone Pure. The manufacturer claims this product is purer and more potent than any other Raspberry Ketone product in the market. Created in an FDA inspected and approved facility, this product is meant to aid in the regulation of the hormone adiponectin. The higher the levels of adiponectin, the lower your body fat will be. You can currently purchase this directly from the manufacturer’s website. GHI Raspberry Ketone Pure is a product which only contains 100 mg of pure raspberry ketone per capsule. They also state this product does not have any fillers, preservatives, or binders. It is recommended you take one capsule in the morning with a tall glass of water and then one capsule in the afternoon with a tall glass of water. There seems to be something wrong with the website. Every time we have tried to order this product, it leads to a blank area where nothing can be done. Therefore, we cannot determine what the actual price is for the product. You should not exceed the recommended dosage for this product. For women who are pregnant or breastfeeding, those under the age of 18, people taking a prescription medication, or someone with a medical condition, you should always contact and speak with your doctor before you take any new type of dietary supplement. If you do have an adverse reaction when taking this product, immediately discontinue use and contact your doctor. The company states their product comes with an “Iron Glad” guarantee. Upon further research, we have found out this means you have a 30-day money back guarantee if you are not happy with the product or the results you have received. The company does detail what the return process is, which is very helpful. We could not find any customer testimonials for this product. Therefore, we could not determine if this product worked for multiple people. GHI Raspberry Ketone Pure seems to be a solid product. Containing only pure raspberry ketone, there are no binders, fillers, or artificial ingredients. However, there are somethings which raised some red flags for us. For one thing, trying to order this product is very convoluted and confusing. We could not place an order despite click on the proper links. In addition, while there is a 30-day guarantee, there are no customer reviews for the product. So you will have to purchase this product blindly and hope it does what the company states it does. While we do appreciate this is a pure supplement, all the other determining factors lead us to not recommend this product for you and your weight loss needs.